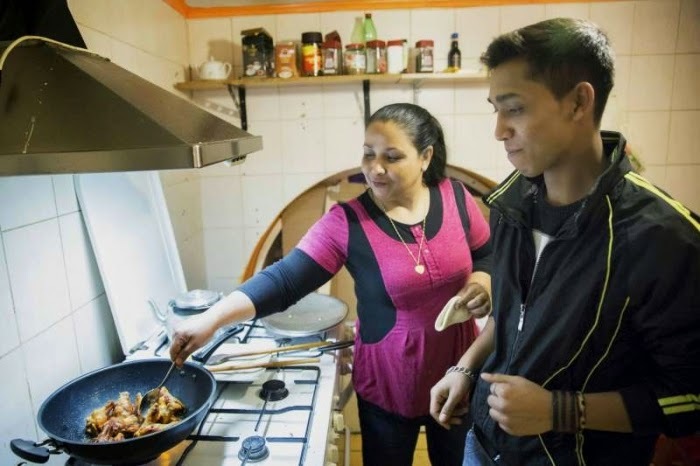 Bangladeshi refugee Begum Ali and her oldest child, Ferdous, cook in their new restaurant in Budapest, where they have found security after a 20-year search for a safe home. BUDAPEST, Hungary, April 10, 2015 (UNHCR) – Family conversation in the miniscule kitchen above the Bangladeshi restaurant in downtown Budapest sounds more like a UN debate than an exchange among close relatives. "A client has just come in. Run down and take his order," 17-year-old Lutfa calls out to her Bangladeshi brother, Kalam, in Greek. Their mother, Begum, after whom the restaurant is named, talks to her husband in their mother tongue, Bengali, as she prepares tasty dishes – but relays commands to the children in Urdu. And 15-year-old Kalam turns to a visitor and obligingly translates the babble into Hungarian. The family's 20-year trek over half the globe in search of safety accounts for their enviable ease with so many languages; they don't even appear to notice as they switch from one tongue to another. "We are very happy to live in Hungary," says father Moshahid Ali. "Here we are safe, and people are so kind. After so many years of fleeing and wandering we want to stay here. This is why we opened our restaurant." It's his investment in the future – and his gift of gratitude now that their odyssey has finally come to an end. They were recognized as refugees in Hungary in October, 2013 and opened the Begum All Modina restaurant some 15 months later. They're working on a shoestring with money borrowed from friends, so they're even stuck with the wrong name for their little place after the sign painter made a mistake on the desired name, "Al Modina." And despite a slow start to their business, much is right about life in Hungary. "Here I can go to school normally, I don't have to be afraid that policemen would beat me up or someone would stab me on the street, like in Athens," adds Kalam, giving some insight into what the family has suffered along the way. Kalam, energetic, gregarious and always smiling, is the youngest of the three children of Moshahid, 46, and Begum, 41. She was eight months pregnant with Ferdous, their eldest child when the couple had to flee political violence that took the life of Moshahid's father and many other relatives in Bangladesh. Ferdous, Lutfa and Kalam were born in Pakistan, where – after a short stop in India -- the family stayed four years. This explains why the parents address the children in Urdu, the national language of Pakistan. But once again the five felt unsafe and fled to Iran, which proved no improvement. On to Turkey. Then Greece offered a bit of stability for nine years – and gave the children the language they feel most comfortable using among themselves, even though they also speak English and Hungarian. In Athens, Begum, though illiterate, held down three cleaning jobs at once -- in a bank, a factory and a nightclub -- but still could not make ends meet. So once again, they hit the road, one that eventually led them to Hungary in February 2013. Ferdous, now 18, and more reserved than Kalam, says he once was a good enough footballer to be approached in Athens by representatives of well-known football clubs. But his mother did not want him to gamble on an unpredictable sports career. Dutifully, he took a job in a grocery store instead. These days, among other duties, he helps his parents buy – very frugally – spices, basmati rice and halal meat for the restaurant in a nearby shop run by a Pakistani immigrant. "I have to put aside my dreams," says Ferdous. "I have to work and help my parents in the restaurant. I have to work and study, no time for football." After nearly 20 years of living in fear and always moving on, finally getting refugee status in Hungary has changed everything for the close-knit family. "It was the first time that we were granted refugee status since we had left Bangladesh," says Kalam, in stylish and nearly accent-free Hungarian. "It's an unbelievable feeling. Recently, we went for a school trip to Vienna, and it was fantastic that I could travel from one country to another with a passport like an ordinary tourist."